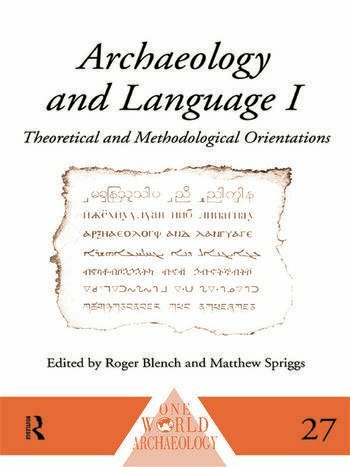 Archaeology and Language I represents groundbreaking work in synthesizing two disciplines that are now seen as interlinked: linguistics and archaeology. This volume is the first of a three-part survey of innovative results emerging from their combination. Archaeology and historical linguistics have largely pursued separate tracks until recently, although their goals can be very similar. While there is a new awareness that these disciplines can be used to complement one another, both rigorous methodological awareness and detailed case-studies are still lacking in literature. Archaeology and Language I aims to fill this lacuna. Exploring a wide range of techniques developed by specialists in each discipline, this first volume deals with broad theoretical and methodological issues and provides an indispensable background to the detail of the studies presented in volumes II and III. This collection deals with the controversial question of the origin of language, the validity of deep-level reconstruction, the sociolinguistic modelling of prehistory and the use and value of oral tradition. Roger Blench is Research Fellow of the Overseas Development Institute. Matthew Spriggs is Professor of Archaeology at the Australian National University. `a coherent overview of an important topic which has been long ignored and/or often disparaged.' - Antiquity, September 1999.